The CNE opens next weekend in Toronto. The Donut Cheeseburger is debuting in the food building this year and honestly, I never thought I’d hear of anything more revolting than Deep Fried Butter, but this one really takes the funnel cake. I’d love to be a good, pious health blogger and rail against the evils of carnival food, over sized servings and price gouging for bottled water, but I really can’t. I go every year and look forward to splitting a bag of hot Tiny Tom donuts, and a giant lemon aid with my friends. I love the Caribbean food and Pirogi vendors in the International food building and I can’t imagine passing any of it up in favour of a sandwich baggie of vegetable sticks I packed myself. 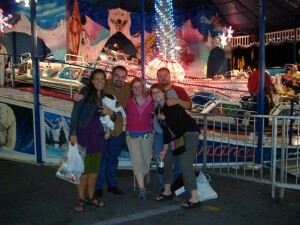 Besides, we usually end up hitting the rides that night and throwing it all up anyway. The CNE is what it is and although it may not be a trail blazer in nutrition and healthy living, they do have a few tokens; the Get Cooking stage or the garden show leap to mind. Personally, I’d rather check out the rock gardens, sand sculptures and horse shows there. If you are looking for a healthy living theme, there are no shortages of those events either. The Green Living Show or Canada Blooms are really informative. The One Of A Kind show has a section of home made treats and preserves for sale and the Word On The Street festival has the hot corn on the cob vendors. The Royal Agricultural Winter Fair is an enormous exhibition of farm fare, livestock, and education on everything from food sources and sustainable living to green and bio-products. Also, they annually prove that butter is much better in the hands of sculptors than deep fryers.